Travelling to America as a gay man you probably think New York, South Beach or San Francisco, well we recently had a little vagaytion to America’s Midwest and we uncovered some wonderful gems. View from the John Hancock centre. 96 floors up. Springfield is the state capitol of Illinois and the political heartland of the state. Every street corner is bustling with political back channelling, clandestine meets and poll rigging… We may have just made that up, but we’re absolutely certain people were talking about The Good Wife. Politically speaking, Illinois is one of the epicentres of US politics, which boasts two Presidents who lived in the state, Abraham Lincoln and Barrack Obama. Whilst you’re there make sure you visit the Illinois State Capitol building (pictured above) and breath in that political air, Abraham Lincoln Presidential Museum, the Oakridge Cemetery, where Abraham Lincoln’s tomb is located, (don’t forget to rub the nose of his statue, it’s supposed to be good luck) and be sure to grab yourself a hot dog on a stick at the Cosy Dog Drive in. You might be surprised to know that Springfield has its very own gay bar, Club Station House – a very friendly affair. On the night we stayed we sang Rick Astley karaoke – the locals had no idea who he was, but they clapped all the same. Stay at the gorgeous State House Inn, but here’s a tip – ask for an odd numbered room. They’re at the back of the hotel – and you shouldn’t be disturbed by the Juggernaut trains that slice through the city at 3 AM in the morning – horns blaring. Obviously, no trip to America’s Midwest would be complete without a stay in Chicago. 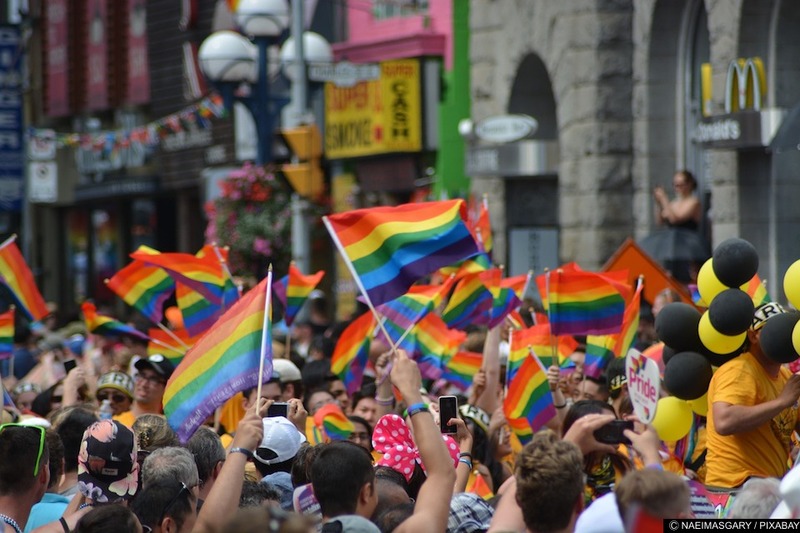 From an LGBT perspective, it’s got two incredibly friendly neighbourhoods – the more youth orientated Boystown and the slightly maturer Andersonville. Of course, there are many gay bars to visit and street festivals to try out, but one particularly sensational event to try, is the Andersonville Annual Midsoomarfest. If you go a stranger, I promise you won’t leave without making friends. When you’re in Chicago top attractions include: The Tilt – a glass enclosure which tilts you out over Chicago, 94 floors up the John Hancock centre, Navy Pier – where you can book an evening cruising on the sleek Odyssey cruise boat and watch as the sun sets on Chicago’s famous skyline, take in a few paintings at the Art Institute of Chicago and if you’re feeling brave – splash out on a helicopter ride overlooking the entire beachfront of the magnificent city. As with all major cities make sure you make time for a river cruise and perhaps catch something at the theatre – perhaps the Blueman group and avail yourself of some Chicago pie. It’s like nothing you’ve ever tried before. Outside Illinois state, in the state of Indiana, you’ll want to try and visit the state’s capital city, Indianapolis, famous for amongst other things the Indy Car Race Track. If you’re around March through September make sure you catch one of the 16 races – and join over 300,000 spectators who revel in the high-octane Indy car racing. If you fancy something a little slower then try a Sedway riverside tour. Honestly, as you take a Sedway tour along the river, you’ll think you’re in a different time altogether – as it looks incredibly futuristic. It’s no secret that Indianapolis’s culinary scene is booming, ask any city-dweller the best place for eats, and they’ll gladly reel off a list of great places. For one of the most incredible meals, you need to dine out at St Elmo’s Steak House and try the Shrimp Cocktail. Indianapolis is home to a number of gay bars and spaces and has one of the highest attended LGBT Prides in the US. If you’re looking for a spot of entertainment then a visit to the Talbott Street Nightclub is a must. They regularly host special events which often feature the gals from RuPaul’s Drag Race. For more venues visit our guide page. If you’re a fan of the fly/drive holiday then you’ll want to check out the Great Lakes Facebook page, where you’ll get lots of ideas for glorious cities, friendly towns and exciting hot-spots to visit whilst you’re in the area. One such find is the ridiculously beautiful town of Galena. Around 3 hours west of Chicago, you’ll drive through miles and miles of farming land – the Midwest is known as the breadbasket of America – because of its wheat production and you’ll certainly see a lot of it. The roads are easy, wide and once outside the city limits mainly free from traffic. You can forget the M6 or M25. Galena is a different world altogether and as you enter through the town’s giant floodgates (it sits on the Galena River which feeds into the almighty Mississippi River) you’ll be left wondering if you’ve actually stepped back in time. Home to just under 3500 people, the town has an incredible friendly laid-back appeal. You must stay in one of the gorgeous, unique suites at the Jail Hill Inn – owned, operated and lovingly restored by the Inn Keeper, Matthew Carroll. Fill your boots at the wonderfully authentic Vinny Vanucchi‘s Italian restaurant. To really get your orientation in this quaint historic town buy a ticket for the Galena Trolleys – which depart from 10 AM until 9 PM. Your guide will take you on a whirlwind stop of this picture perfect town. If you’ve a head for heights book yourself on to the Balloon flight experience – and see how beautiful the Midwest countryside is from the sky. As you float several thousand feet up let yourself drift with the wind – who knows where you’ll end up next.